TR13CE: DUCK SEASON! RABBIT SEASON! NO DUCK SEASON! 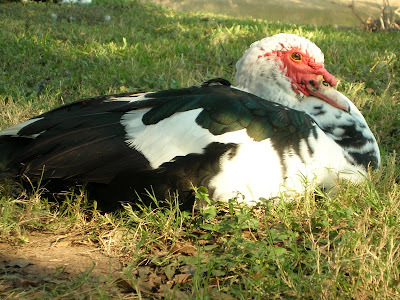 If you’ve been looking for the ugliest duck in the world, your search stops today, my friend. 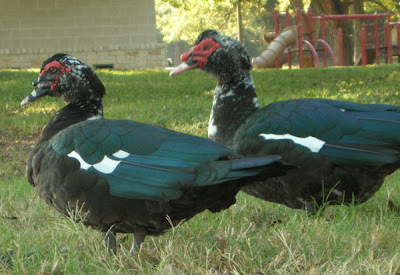 Waco is the proud home of Muscovy ducks. Damn they’re jacked up. Actually, I thought they were hideous when I saw them from afar a few days ago (turkey features, mishmash coloring). But today I hung out up close with three ducks I’ve seen along the Brazos River, and they’re kinda cute in an affront to God sorta way. 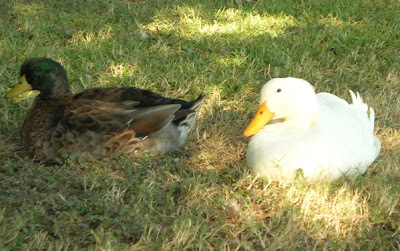 See these here duckies are mules (they hook up with others species and spawn some sterile offspring). So you can’t hate too much on ’em I s’ppose. So yeah, me and the Muscovies are cool — definitely not like these arrogant, conventional MFers (“we’re pretty and can reproduce”). Pricks. Heheheh. Long live Lil Bunny Foo Foo! I didn't hear them quack, so you're probably correct. I love the costumes. I definitely missed out on a good time in Temple. Maybe I'll be Elmer Fudd for Halloween next year.